A pack of 11 fossils with individual note cards, a magnifying glass and a geological time chart. BONUS FOSSIL as the pack label says it contains only 10 fossils! These specimens are smaller than we would normally provide but the pack is such good value we couldn’t walk past them. 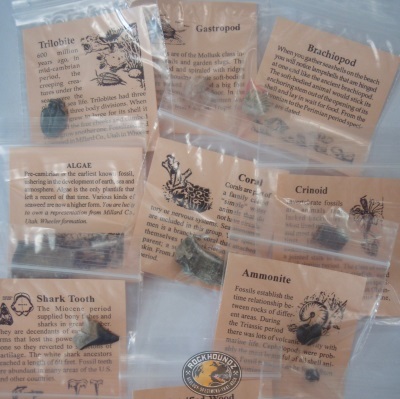 Fantastic present for a kid into rocks and fossils. This kit could also be turned into a lovely display for the classroom or used for teaching. The specimens are robust and can be handled by students without damage. Image is a representative sample only.